Want to have a full color photo image on your menu cover? Looking for something particularly unique to make your menus stand out and create a lasting impression? The Monticello Window just might be the right fit for you! The Monticello window is a die cut shape from the cover with an inlay of your choosing in the cut out area. Choose from a full color photo print inlay, printed material inlay, removable pocket inlay, Patina copper inlay, or authentic wood inlay. Photo image set permanently in a die cut window with a matte overlay. Send in your high resolution photo image or design to be professionally printed on quality paper and built into your cover. Foil stamped or blind deboss logo in your choice of material in a die cut window. This option adds a rich layer of depth and texture. 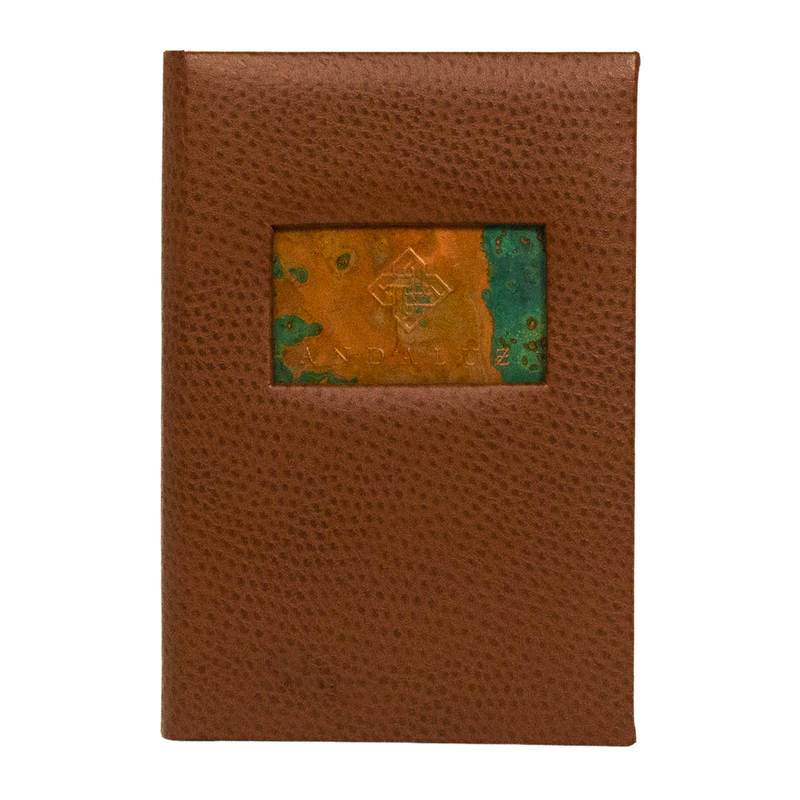 Emboss your logo into a unique patterned patina copper material window. Window is authentic copper material for an organic luxurious aesthetic. Laser engrave your logo into authentic wood and inlay into your choice of cover. Wood windows are the perfect accent to add a natural element to your cover without committing to a full wood menu cover. Print your own image using our free digital template. Make changes anytime and print yourself. 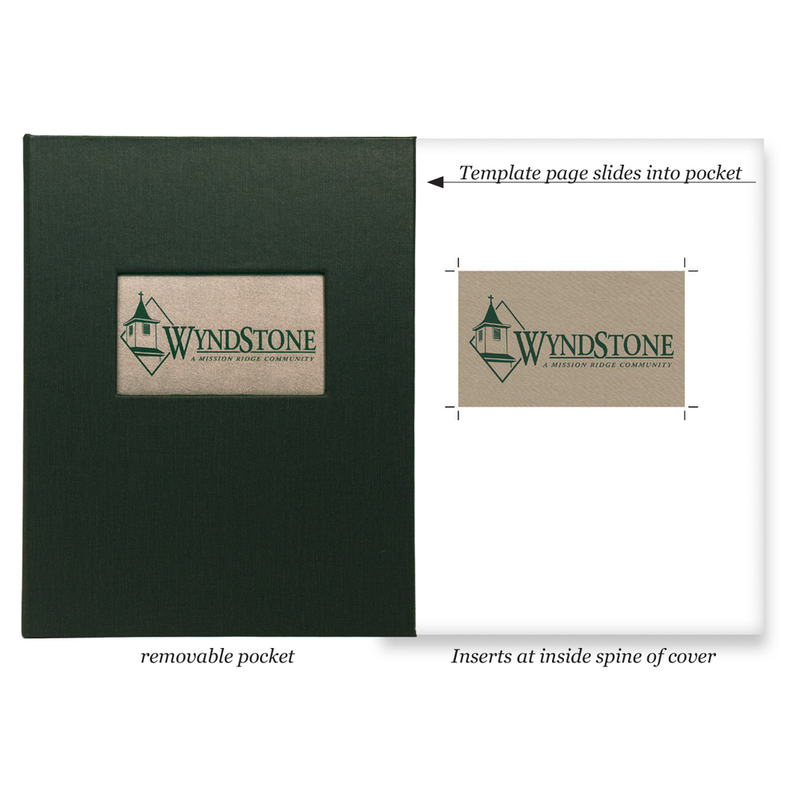 Template page slides into pocket of cover. We offer a variety of sizes and shapes for our die cut Monticello Windows. Choose your size or have our creative team determine the best size and shape window for your artwork. Custom sizes are also available - must be custom quoted. Monticello windows are an add on to any of the standard Risch Menu covers. Let us know all below information upon purchase order. Once purchase order is received we will create a digital proof for you to sign off on and we can start making your custom cover!